What does this actually translate to in practice? We have a few designs for small, sturdy “huts” that can be built and assembled for between $300-$500 and well under 50 man-hours. We then find reasonable candidate(s) for these huts – typically stable camps of homeless individuals already living in tents/makeshift shelter – and assemble the hut on location. The huts are not owned by Mad Housers. They are stable, safe, and secure – complete with a locking door. 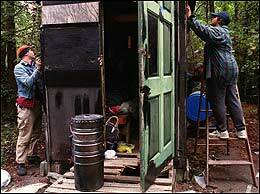 The organization in Atlanta currently has around 50 occupied huts around the metro area. But will this work in Nashville? Simply put: we don’t know. Nashville is a smaller city with a much more hostile attitude towards its homeless population. Luckily, the folks at the Nashville Homeless Power Project have graciously offered to help out where they can, and they believe it could work. If anyone would know, it’s them. Nails - 16, 8 and 6 penny. Industrial garbage bags</ul> Again, if you’re at all interested, please join us at the meeting. If you have any friends/family that you think would be interested, pass this on to them. RSVP is not required, but feel free to let me know if you plan on attending so we can get a feel for attendance. Please come on out – if you’ve ever wanted to do something about Nashville’s growing homeless problem, this is a way you can contribute – even if it’s just on the occasional Saturday morning. If you have any further questions, don’t hesitate to leave a comment or e-mail me. Also be sure to check out the Mad Housers’ Website, this article in the AJC and this interview with former President Nick Hess.